The definitely catchy name stands for a relative clever Deploymentmodell for Windows Azure. Base is the fact, that the Web Roll of Azure is able since a few versions are able to use the full IIS. That means, in one Web-Roll many websites are able to run. The configuration was a little bit bulky so far. The best fact: You can use WebDeploy on Azure and it will be saved so all things are persistent on the Blob Storage! 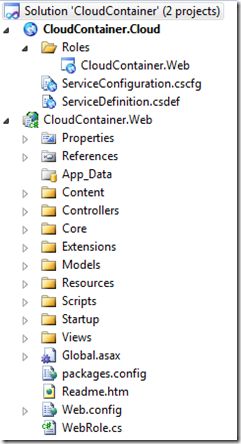 What’s the “Windows Azure Accelerator for Web Roles”? In fact it’s a new projecttemplate including a kind of “Container-App” (the “Website Manager”). You don’t have to change anything on the project – you will be guided through a Wizard and set the used Credentials for the WebDeploy. You don’t have to change anything on the last project. This application will receive the “WebDeploy” packages later on and put them on the Blob-Storage afterwards. Beside this application takes care of endowing every instance with a configuration package. That’s why it’s named “Container”. Wher did I get the “Windows Azure Accelerator for Web Roles”? Windows Azure Accelerator for Web Roles on Codepex! The only disadvantage that gets into my mind is that in some Azure Instances the Web Site Manager runs as well and (like the name says) it is produced for Web Rolls only. But the name also betrays that the Deployment will be much easier on Azure.